When you pasture cattle or other animals, a good barbed wire fence is a necessity. Build a quality fence in no time or repair a sagging or downed fence with Bekaert High Tensile Gaucho Pro Cattleman 14g Barbed Wire from Farmers Coop. Bekaert’s Cattleman 14g Barbed Wire is the strongest, longest lasting barbed wire fence on the market and is perfect for the most demanding fence jobs. 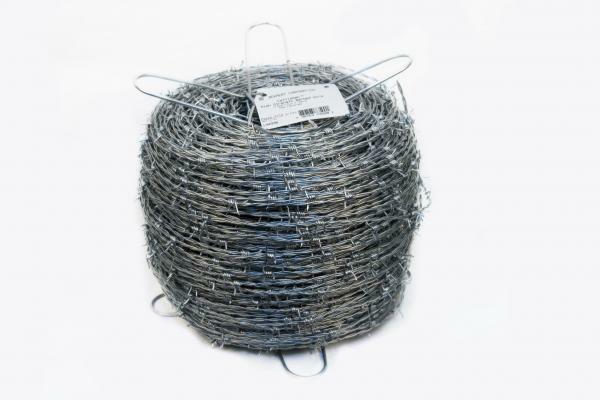 The reverse twist design and Class 3 galvanized coating have proved Cattleman 14g Barbed Wire to be 30% stronger than 12.5g low carbon and Gaucho 15.5g High Tensile Barbed Wire. The galvanized steel finish is designed to prevent rusting in any weather conditions. The steel material also prevents sagging and requires less maintenance. Not only will the strong material not sag or rust, but it also requires fewer posts, saving you money. In addition to Cattleman 14g Barbed Wire, Farmers Coop also offers Bekaert Gaucho Green barb wire. Stop by your local Farmers Coop for all your fencing needs. Want to find out more about Bekaerts Barbed Wire? Watch our quick video. This entry was posted on Tuesday, December 19th, 2017 at 12:31 pm	and is filed under News & Updates. You can follow any responses to this entry through the RSS 2.0 feed. Both comments and pings are currently closed.